I'm after some advice from the Courchevel veterans: we're flying out this Saturday - can anyone recommend any nice and relatively cheap mountain restaurants to get a beer and chips at lunchtime? @WillowWilson, plenty of good cheap places if you know where to look. In the Courchevel valley I like Bubble Bar over in 1650, and Bel Air at the top of the Ariondaz lift. La Tania has lots of inexpensive places to eat, but for beer and chips Pub Le Ski Lodge is probably what you're looking for. Slightly more upmarket but still not breaking the bank would be Courcheneige on the side of the Bellecote piste as you come back into 1850, and the Bouc Blanc at the top of the La Tania gondola. If you're skiiing into the other valleys then there are plenty more places to choose from - St Martin is worth a trip for the burgers at Dahlia. The trick is to look at the menu/prices before you go in, and if it's too expensive ski on to the next one. 1650- one of my favourite places is la boullete. but you have to walk down onto the main street, basically behind the ariondaz bubble. lovely little place, does great food at reasonable prices. - when you ski under the 1850 lift building headin for 1300/1500 direction, theres a restaurant just on the left (used to be called bar le jump) its not the chepeast but does really good burgers that are massive! - in the 1850 shopping centre, attached to the ski/ board shop (think its called la luge??) its good too. - right at bottom of 1850 lifts- the polar cafe. despite its location we found it reasonably priced! but check out www.latania.co.uk they have a huge list of places and reviews/ guides! Polar cafe - now our place to stop for a drink (used to stop at courchneige), cheap for c1850 prices, 3.50 for a coffee, some nice seating inside but it's not a big place. Cakes look good, but not tried them yet. @little martin yeah we were very surprised last season, we were in a rush to grab lunch before a lesson, didnt have time to go searching and was pleasantly surprised with the prices considering its right at the bottom of the slopes beside the lift station. the cakes did look amazing! The Cafe del Mot (ground floor of the Hotel Mottaret) in Mottaret is very good value - 9.95 Euros for plat du jour or burger and chips plus a drink (beer, wine or soft). I would also recommend the Steak American (baguette, burger & chips) at Snow Food in the centre of VT (next to the ski doo hire base) - 7.50 E but find it is enough for two! Also like the Igloo in Reberty (Les Menuires) and L'Eterlou in St Martin (next to the bottom of the Village drag). The latter does a 3 course menu du jour for 18.50 E. The Meribel Un-plugged '3Vs Lunch Guide', which can be picked up in a lot of bars & restaurants, lists some of the better value establishments but check prices. There was a new cheap-and-cheerful sandwiches and paninis type hut right at the bottom of the Pralong lift this year too. It looked like it was being run by S3V (the lift company) and I wonder if they're trying to provide some food outlets at the cheaper end of the market to address the stereotype of Courchevel only having expensive restaurants. I miss the self service that used to be in Chenus - are there any others now? Think that opened last season or season before, but another cheaper place to eat. Not tried the places at the entrance to the courchneige this season. I think the Courcheneige changed hands this season (or last? ), and is no longer (relatively) cheap. We use that one for mid morning coffee or afternoon hot chocolate, been there couple of years now. Although not in itself particularly cheap I did very much enjoy a couple of goes on the new 3km luge track in 1650 if you need an excuse to head over there for a cheaper lunch. Was wondering what the new luge run is like. Sounds like it's worth a go. Looking forward to it. All pistes excellent today at every altitude thanks to pisteurs and lower temperature. I’ve been a silent reader in this forum for a while and need to seek your advice today. I’m currently in the 3V and first of all I agree with the posters above regarding the lovely conditions of the pistes at the moment. I have mostly had hardpack on my past trips, so almost forgot how amazing it is to snowboard on actual snow! I’m supposed to leave this weekend, but think about extending a bit. BUT there is a lot of snow and wind in the forecasts for several days. Normally I wouldn’t run away from snow, but given last week’s situation, I’m not sure what to do. Do you think the situation will be similar with most lifts closed for several days etc? I’m only doing easy pistes at the moment, no offpiste. I’m worried to spend money and time to end up stuck in Brides-les-Bains worst case. Would it be better to go again another time this year instead? Or to another resort? The ex owners of the Courchneige now run the Pomme de Pin hotel next to the stadium and opposite the Chabicho. The lunch time menu there is very reasonably priced. http://www.meribel.net/images/PDF/Hiver/FR/NAVETTES-GRATUITES-Meribus.pdf The last bus from Meribel Village is at 00.40 or 00.35 from Meribel Centre (NB Village is not the centre of town). There are usually plenty of taxis from Meribel Centre or numbers to call in the Meribel guide book. I don't know the current rates. They often charge per person. @Simony My recommendation, if your travel and accommodation arrangements are flexible, would be to stay until Monday evening or Tuesday. The forecast is showing that it will be very breezy on Wednesday and Thursday, which combined with the anticipated heavy snow falls, will mean that it is likely that the inter valley links will be closed or, at best, delayed. Heading to VT on Saturday. Going to be gutted if we lose a days action due to a storm. Going to La Tania on Monday and now debating on whether it is worth getting a full three valley pass or just the courchevel pass....still at least we are in the right resort for trees. Looking at the forecast I personally would be leaving on Monday. Tuesday and Wednesday look like two days of snow and high winds. Unless something changes dramatically it looks like being a tough couple of days with limited opening. Probably some decent skiing below the tree level. If you are staying in Brides leaving midweek at a quiet time of the season shouldn't be an issue. But as I say on balance yeah I'd be heading out. Could be two days looking at the forecast. This season is shaping up to be something else. I like the positivity. People underestimate the importance of access to runs below the tree line IMO - especially at this time of the year. Personally I would still buy a 3 valleys lift pass. Before and after the midweek weather you can make plenty of use of it. Much more like it! 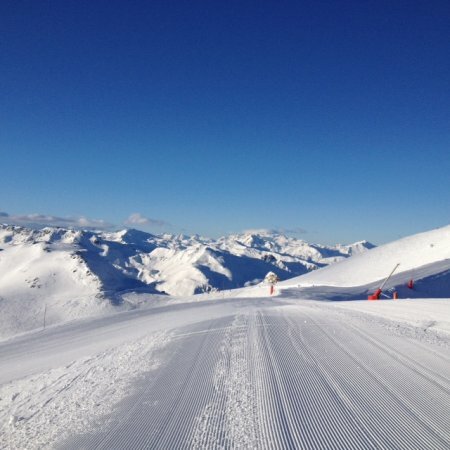 Sun, blue sky, cold and perfectly groomed pistes. Top of Suisse at 9.25 am. Folyeres, Moretta and Jockeys would be just absolutely sublime next week. @2planks There are a number of pretty, tree lined runs currently open in les 3Vs, which have frequently been closed in recent years. These include Le Raffort and Les Villages run to Les Allues in the Meribel valley. Le Raffort has been significantly widened in the lower stretches, this year. The Les Allues run is still more of an itineraire and not so suitable for boarders, as it is pretty flat in places. The former walking path from the bottom of the Aiguille du Fruit lift, in the Creux sector, has also been turned into a piste called le Plan du Vah. This leads down to the road between Courcheval 1850 & 1650, where there is a bus stop. However, it is possible to cross the road and continue on down the path towards Courcheval 1550. Here, you can do a short climb to the left to take you onto the bottom of the toboggan run, which leads to the Grangettes TC. Again, parts of the run are pretty flat making it unsuitable for boarders. @Mike S, thanks will keep an eye out on the map for those, as long as the wind doesn’t shut the links will be a fun Monday to Friday trip, although might be slightly underskied on my Scott neo’s. Awesome day today; much colder. We had a crack at the escapade, but a mistake or two put it out of reach. Still, 92km skiing and 15km vertical. Great piste conditions everywhere, and lovely down to St Martin. Now might be a good time to explore lower runs - a liftie also recommended the run down to les allies as per Mike S.
@Mike S, @Layne, thanks for your thoughts! I’ll try to extend a day or maybe two and then leave. Although it’s a shame to run away from snow! Oh well, seems to be the reasonable thing to do. anyone got a link to a decent webcam for the croisette area of les menuires, similar to the Meribel centre Le Pub webcam on merinet.com (though sadly this has not been operational since the beginning of November). The official LM webcam is pants, as it is miles away, i prefer to see what is going on in the centre of the resort!! we are out in LM in feb, and getting very, very, VERY excited!!!! sadly, i used to watch the meribel webcam from the beginning till the end of a season for years, even though i was not even going on any trips out there!!! Fabulous pistes all the way. Sunny and cold. Perfect. @terrygasson Have you seen https://lesmenuires.com/webcams/webcam-panoramique-clocher-croisette/ ? Agree it is possible to cross the road and continue on the path, and a few people do it. But be aware that it is a pedestrian path rather than a piste - so only a few metres wide, tree-lined, and in places has limited visibility. Pedestrians will have right-of-way over skiers, so you need to be able to stop pretty instantly if you round a corner and find someone walking towards you! thanks @Mike S, i have seen that one as well, i was just hoping there might be a private one, that is closer in the centre of town, a bit like the Meribel town centre (though this one is still knackered for some reason), As i like to get a better perspective of what is going on. it was always good to see the Meribel one (Megeve has one as well) with the snow conditions on the roads and the buildings, and with people milling about (as i have said previously, i am a sad git) .